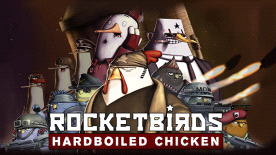 Set out on a mission to assassinate the totalitarian penguin leader as Hardboiled Chicken. Destroy enemies with a slew of weapons and illuminate the secrets to his past while uncovering the real enemies of Albatropolis. Master fowl play in the co-op campaign as a pair of Budgie commandos on a mission to save the general's daughter. Many lives will be destroyed, countless penguins will die! Mini-stories – Uncover the truth about the totalitarian regime and Hardboiled's mysterious past through unlockable cut-scenes and music videos.